You must make reservations at least 5 minutes in advance of the time at Rizotto Ristorante. "Since opening in 2012 Rizotto Ristorante in Amherst has truly become local entrepreneur Michael Rizzo’s signature restaurant. Rizzo’s fifth restaurant in Western New York offers an upscale dining experience with a menu that features a wide array of items including fresh seafood dishes, fine cuts of beef and traditional Italian pasta. A trendy Antipasto bar offers the perfect prelude to any meal. Guests can choose from a variety of items including roasted and grilled vegetables, specialty meats and cheeses, and several hot items such as homemade sausage, meatballs & chef’s mussels du jour. ​Complimenting the dinner selections, Rizotto Ristorante also offers a daily lunch service between the hours of 11:30 a.m and 2:30 p.m. Whether it's lunch, dinner or banquets, Rizotto Ristorante truly redefines fine dining." The food was delicious. There was a nice variety for the appetizer, entree and dessert. We also got a complimentary limoncello after dinner. My only complaint was that service was kind of slow (I don't think it was the waitress, but perhaps the kitchen). This would not prevent me from going back. It was the final day of Restaurant Week and I think they may have been a bit short-staffed and had several very busy days prior to Sunday. Everyone was very nice and food good but the service was extremely slow. From the time we sat down and waited for a server( tables that were seated after us were served before us) the wait times in between meals was long. Came to dinner at 4:30 and we didn’t leave until after 6. The sad thing was it wasn’t just us, it also other people in the restaurant ( heard many complaints) not sure if under staffed or how tables were distributed contributed to this. We live in Orchard Park and it def worth the drive to tbe Northtowns. Great staff, even better food!! Food was excellent! Busy because of restaurant week, But our Waiter handled things well! Would definitely go back and we have been there in the past. Three years ago we had a baby shower there and it was excellent. Experience almost identical to that of other restaurants in this “chain” which shouldn’t be surprising. Food is average at best, service & mgmt very disorganized. Ambiance fair to poor of an atmosphere not well thought through. We won’t go back. Our waiter was Derek. He was awesome. It was restaurant week so it was busy. Limited parking. Food was good. Price for meal was exceptional. Horribly long wait to be seated even with a reservation. Waited 15 minutes to even be greeted or given a menu. Waited an hour and a half for food. We went to Rizotto during restaurant week, so i understand it was busy. But the service was not very good. It took us about a half an hour to get our bottle of wine to the table and when it was time for our dessert our server said "oh i straight up forgot about you." It was funny however the person that was waiting on that dessert waited about 20 mins. The food was so delicious and because of that we will for sure be back! Very good food. Service was friendly but staff didn't seem prepared to be able to handle the large crowd. We went during Restaurant week, and it was a fantastic experience. Although the restaurant were extremely busy, the service was outstanding. Our server (Jen) was efficient and cheerful. The three course meal was delicious. We chose the beef tenderloin- it was cooked exactly as ordered , and was seasoned perfectly. The highlight of the meal was the strawberry gelato in a waffle bowl- both made fresh in house. 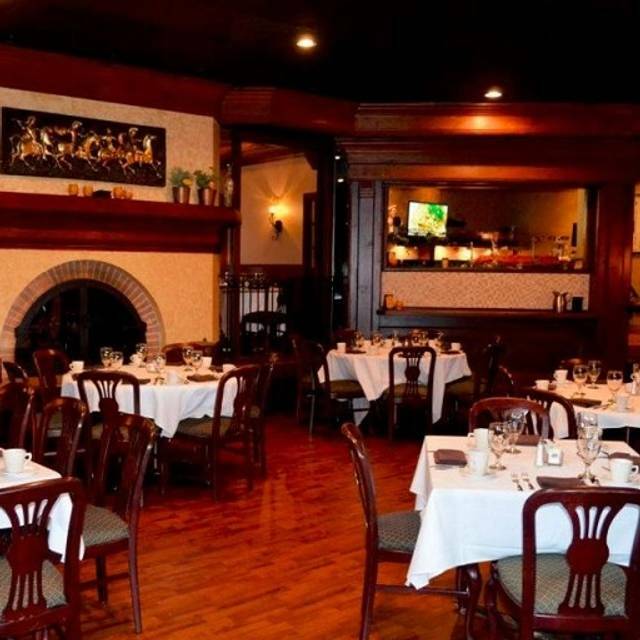 We would not hesitate to go back and will recommend Rizotto Restaurant to all of our family and friends. Food was superb and prices were very reasonable. However we did wait quite a while for a table despite having a reservation. Beautiful restaurant, excellent food, and extremely vigilant and kind service. My only problem was we had a reservation for 7 and didn't get seated until 7:15. Still worth the wait! Very pleasantly surprised by an excellent restaurant. Will go again . Saturday night had a very big crowd which caused service to be very, very slow. Our waiter took our order and came back in 30 minutes to tell us that the two orders of Grouper couldn’t be because there was no Grouper available. Twenty minutes later he came back to get our order which was brought to us 30 minutes later. Food, as usual, was quite good but the bad service caused the 4 of us to be a bit dissapointed. We’ll probably return but will check to see what the crowd is like before heading out. Total experience was top notch from the wait staff (Rick) to the food to the ambience and music. Overall was a great dining experience and I would recommend this restaurant to anyone looking for value and great time dining out. We had a great time celebrating a birthday. We had a large party and felt well taken care of. The food and service was great. Our server Nick was awesome! Super attentive to our party and made sure we had everything we needed. My daughter's birthday was awesome and he really made the entire evening splendid! We were a party of 11, seated in a secondary area off of the main dining room. There were other tables in that area (but no diners seated) and it was very close to the bar where there was live music playing VERY loudly. The manager did come over and offer to have then tone down, which they did, but it was still very loud. The main dining room was not very busy, so I am at a loss to explain why it took several HOURS for our dinners to be served. In all, our meal took almost 3 and a half hours. The waiter was friendly but clueless and was rarely available. We even had trouble finding refills for our water. We might as well have been seated in the basement - we were basically forgotten. When the meals finally came out, several were cold AND they completely forgot one (the easiest of all - fish fry), leaving a companion without her dinner (no way we were waiting for that to be prepared!). We took advantage of the offer of free desserts - mistake. That took almost 30 minutes to come out as the pastry chef had already gone home for the night! It's a pity we won't be back because the food is good. We had driven past this restaurant for a while and finally decided to give it a shot. Glad we did. The food was well executed, the portions were generous and the prices were reasonable by today's standards. The waiter was super friendly and helpful. They have a great selection of food on the menu that ranges from burgers and pizza to seafood and steaks. All the pastas are made in house and the one I had with a short rib ragu was delicious. Definitely recommend it. Have been to Rizotto's for several weddings and showers, and have always had delicious food. This time we enjoyed a lovely dinner! Four diners - and not an empty plate when we were done! We will definitely return and recommend! Awesome dinner, great service ...everyones meal was fantastic! Really nice restaurant - friendly staff and food was outstanding. We will definitely go back. Love the bar area - spacious and pub tables with fireplaces. Great place for date night or out with friends. Highly recommend. Made the top 50 Best Restaurant list in the November 2018 issue of Business First as well! Food fine; ample portion. Good value, especially with two "appetizers" included with entrees. Our waiter was polite only reason for giving 3 stars for service was rather lengthy delay in bringing the appetizers after order plus mistake mixing up one of ours and another patron; mistake was promptly remedied. Ambience very pleasant. Noise level fine. I would certainly come again. While the food was good, it was NOT worth the wait. We waited about five minutes for someone to greet us at the host station. We then waited about 20 minutes to place our orders, then another 20 minutes for our selection from the antipasto bar. We had to cancel our appetizer order because that too took way too long before our entrée, and we had to leave for a movie. We thought 90 minutes would be a perfect window to have dinner and not rush. We don't recommend this place to anyone who has someplace to go afterwards and is on a time crunch. I know good food takes time, but the waiters should NOT be lollygagging when it comes to orders, drinks, etc. Good food and lovely experience. Well done! I love this restaurant but the food was lacking this time. There was so little sauce and even when we asked for extra for 3 meals it just did not suffice. We were disappointed but still love the restaurant and will ask for more sauce to begin with next time. Fantastic food, good portion sizes, friendly staff. The price might rack up on you because you want to try everything, but everything was delicious. The appetizer, entree, and dessert all deserve 5 stars. First, our meals took over an hour to arrive. Second, my $36 sea bass was rare in the middle. Third, my husband ordered chicken and his piece of chicken came with a large cut, as if the cook needed to cut it to make sure it was cooked. It was a little disconcerting. Also, our meals did not arrive at the same time. I know it was Valentine's Day, but it was not that busy. Finally, my husband's napkin was dirty when he unwrapped it. As our waiter was not that attentive, my husband dropped his napkin on the floor in the aisle going to get the waiter's attention. It did, and our waiter snatched it up with the promise of another napkin. It never came. We won't return. My fiancée and I went in for dinner tonight for a reservation at 7pm. Neither of us have ever gone here before so we were excited to give it a try. We were sat in a back room which was very nice, but I thought it was weird that above their fireplace was this giant TV on a PowerPoint loop showing daily specials and upcoming events (totally killed the ambiance). Server came after a few minutes of us sitting down and brought us water. We asked for a minute to look at the drink menu and she then came back 15 minutes later. We ordered our bottle of wine (and dinner, because we were ready by that point). Our bottle of wine took 15 minutes to arrive at our table from that point. 50 minutes after being there, our appetizer came out. Then we didn’t see our server until 35-40 minutes later when she caught us giving her a glare (food still hadn’t come out yet). She told us food would be out shortly and was sorry for the inconvenience. Then a few minutes later our food came out. To make a long story short of all of this, the service was VERY slow. We didn’t see the server very much. And we left our 7:00pm reservation at 9:45pm (believe me, we weren’t just taking our sweet time). Food was good, but in the moment was just super unhappy with the long wait times we had. We definitely didn’t get our bang for our buck in terms of service. Turn off the stupid TV in the dining room killing the atmosphere and fix your service issues and we’ll be back. Otherwise, see ya later. We've been enjoying our Valentine’s Day dinner there since they opened - and we will continue too! Unfortunately for a holiday,Valentines Day, the waitress was responsible for ten tables. She was very good however couldn’t possibly take care of everything. My lobster was over cooked, very difficult to remove from the shell, and no melted butter to accompany it! Great meal but it took almost 40 minutes to get our food from the time we placed the order. A friend and I met here for a quick Friday night catching up dinner. The high quality of the food was a wonderful surprise. My seafood dish was perfect and my friend enjoyed her chicken franchise. Our server Derek was attentive but never intrusive. I will return soon. Very good food. I enjoyed a quiet dinner. Had the chicken parm, was very good! First time at Rizotto. Staff was friendly and informative. Food was presented well and of good quality. Would definitely recommend.